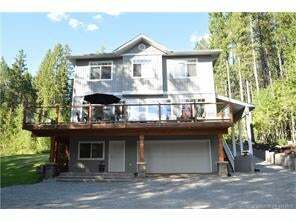 Welcome to this beautiful custom built acreage property. Sitting on just over 7 acres, this lovely home features 4 large bedrooms, 3 bathrooms, and is finished with the highest of quality throughout. The gourmet kitchen will appeal to all chefs and it is the perfect area for entertaining many guests. The open concept great room is complete with 9ft ceilings, a wood burning stove, and a feature wall of windows looking directly at the monumental mountains. The large wrap around deck is perfect for any occasion on those warm summer days. The master bedroom is large enough for a king with furnishings, has a en-suite attached, and a walk-in closet. Everyone will feel right at home in either of the three large additional bedrooms. There is also a large office, full work shop, and fully insulated attached garage. At the beginning of the lane way sits a detached garage perfect for all your toys and equipment. This truly is a one of a kind home with complete peace and tranquility. Do not hesitate call your REALTOR® today!